Birth of a Hero is part 1 of an ongoing series of stories, available on dashingdon.com as a Choicescript game/story. Alice, a teenage girl born aboard the Federation Hero Ship Justice is involved in an accident while on a school field trip in the engineering section of the ship. Massive exposure to some rare and highly reactive material nearly kills her, but she survives and becomes the latest superhero, helping to protect the ship and mankind against all comers. 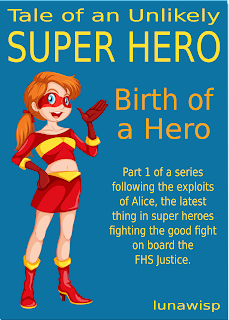 At present there's no part 2 because Alice actually doesn't yet have a superhero alter ego. Once Ship of Heroes is released, I'll write the next part following her rise to superhero stardom. 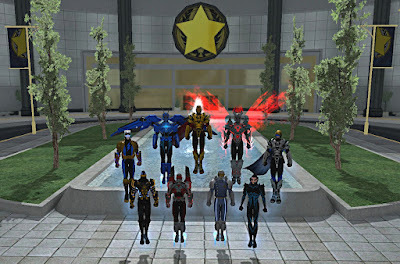 See http://www.heroesin.space for news about Ship of Heroes. Paragon Chat allows a user to log in multiple times on the same account so, depending on your PC's abilities wrt memory and CPU speed, it's possible to have many toons logged in simultaneously. The image below shows nine of Golden Avenger's toons logged in, nicely arranged to show off their impressive costumes. There was another off camera, all on the same account and on the same PC. To find out how to do this, take a look at pchat.life for more details.